Do you sell coffee in your business? And, do people sometimes take that coffee with them when they leave? Those are not uncommon questions. So, let’s try to tackle them so we can clear away any confusion and help you decide what’s the best option for you. 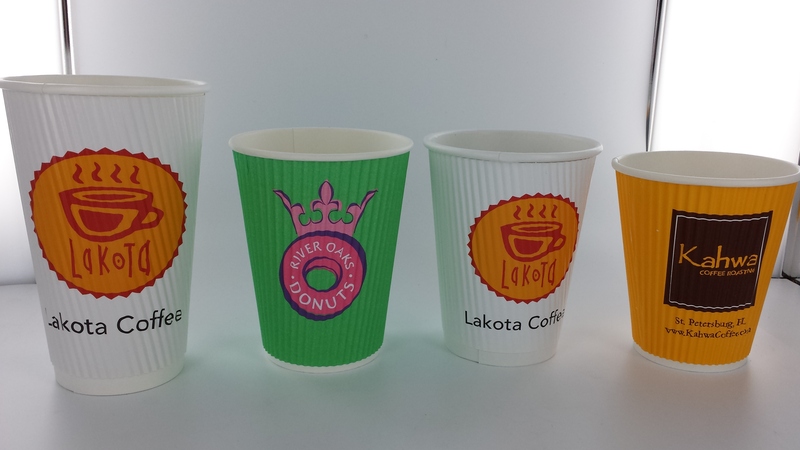 Let’s look at each option you have available when it comes to branding and custom printing your paper coffee cups. Custom printed coffee cups sleeves are a great option for so many reasons. Of all the options we’ll discuss, coffee sleeves have the lowest minimums at 4,500 sleeves. And those low min’s coupled with the fact that they store flat, means that this option requires the least amount of storage space in your business. Another great aspect of coffee sleeves is that our standard sleeve can usually fit numerous sizes of cups such as the 12, 16, and 20 oz cups. So you don’t have to keep several different sizes on hand for each size cup you offer. Now, I’m guessing pricing is something you’re also curious about. The two big drivers behind pricing for coffee sleeves is the number of colors in your artwork/logo and whether we’re custom printing on 1 side or 2 sides of the sleeve. Having said that, for custom printed sleeves we could be looking at an investment of $0.09 – $0.15 per sleeve. 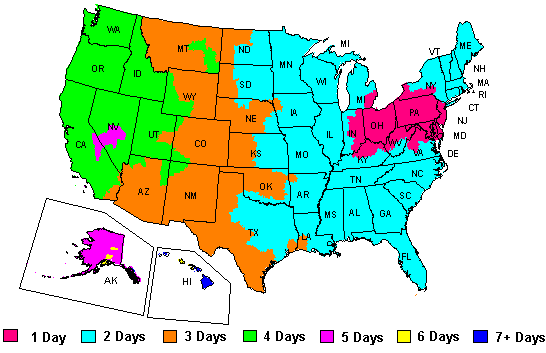 Turnaround time on coffee sleeves is also very quick – usually in the neighborhood of only 2-3 weeks. Sound good? Now let’s move on to custom printed cups themselves. OK, first things first, you might be wondering what does “double insulated” mean. A double insulated cup is just a fancy industry term for saying that the paper coffee cup and sleeve are combined. So, it’s a cup that’s manufactured with a larger sleeve already glued around the cup. And while we’re at it… the word “Groove” is referencing the ridges in that exterior sleeve. The purpose of those grooves is to get separation from the cup wall and allow air flow. You see, if the sleeve and cup wall we’re completely flush against each other, heat transfer would be greatly increased. But with separation and air flow, your hand stays cool. For a custom printed double insulated coffee cup, this particular “Groove” style offers the lowest minimum on the market at 10,000 cups per size. So, if you’re looking at 2 or 3 different sizes, that’s 20,000 and 30,000 cups, respectively. Which of course brings up the topic of storage space. Obviously the storage space you have available is going to play a key role in whether this option is viable or not. Now, what are the advantages of this option? Well, for starters, no sleeve is necessary. It’s already combined, remember? Additionally, pricing-wise, you get the same great pricing whether your artwork has one or multiple colors. 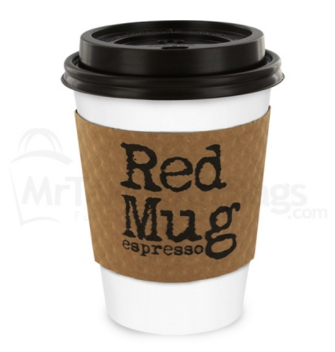 Likewise, we can print on one side or all over the entire cup and your pricing won’t increase. Speaking of pricing, the only determinant is the size of the cup. So, with cup sizes that include 8, 10, 12, 16 and 20 oz, pricing will range from $0.15 per cup to around $0.25 per cup. Finally, it’s probably safe to say that the lead time on these types of custom printed cups is roughly 6 weeks from the time your artwork is approved. And last but not least, moving from the “Groove” cup, there are two additional brand name double insulated cups: the Ripple Wrap (left in the image) and Planet+ cups (on the right). 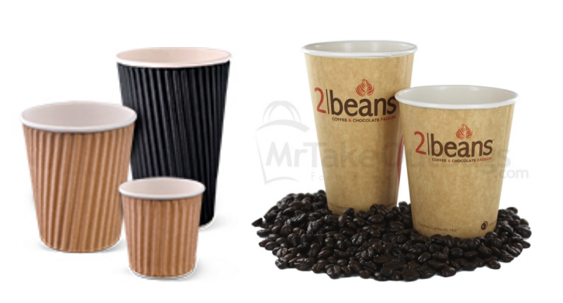 While a lot of what I mentioned in the previous section will also apply to these 2 cups, one primary difference is that the minimum quantity you need to order jumps up to 25,000 cups per size for the Ripple Wrap and 50,000 cups for the Planet+ cups. Other noteworthy differences are that the Planet+ cups are 100% fully compostable. So, if being environmentally conscious is a major theme to your business, this may be the option for you. The major bonus for the Ripple Wrap cups has to be it’s super thick corrugated paper and deep ripples. These cups are such a pleasure to hold and keep your hands as cool as the other side of the pillow. Available sizes include 8, 12, 16 and 20 oz. And because you’re probably curious, pricing ranges from $0.13 to $0.23 per cup, depending on the size. So there you have it, the 3 main options you have available to help you advertise your business on the back of a cup of coffee. So, if you want to have your customers advertise your business for you, MrTakeOutBags can definitely help you. You can simple click here or go ahead and give us a call at 888-321-2248. Next Article: The 5 Most Famous Delis in the U.S.